For a rat, a human home is the perfect breeding place. It has the three things they require: food, shelter and water. They don’t only inhabit homes, either. They enjoy lurking in and around shops, warehouses and any indoor space that has access to the outside. However, these arguably cute critters should not be a welcome guest. Carrying germs, disease, and contamination, they can pose a serious health risk to you, your family and your coworkers. We’ve put together the 5 key signs of a rat infestation that you need to watch out for. Usually located in the pantry or cupboards, droppings are the first clue of a rodent infestation. It’s also crucial to know that mice droppings are different in appearance to rat droppings. Mice droppings are smooth with pointed ends, and are 3mm to 5 mm in length. Rat droppings are shiny black and depending on the species will be from 12mm to 18mm long. If you see signs of rat droppings, you will need to conduct further investigation for a rat infestation. Unusual sounds are also one of the top signs of a rat infestation. 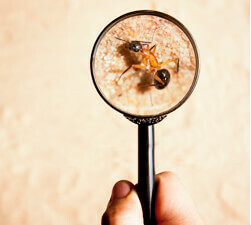 Before you see visible signs, you will probably hear scurrying and scuttling in your roof or around your house. These foreign noises can also excite pets, causing them to try and find the noise in question by clawing and chasing. If you hear strange sounds that may be rodents, try and locate the source of the sound. One of the most irritating and dangerous signs that rats have infested your home, is damaged food packaging. 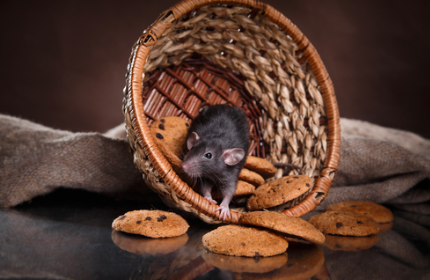 Rats love to eat, so make sure you clean up after yourself to avoid them being tempted. If you do find damaged food packaging in your home, take action immediately. Throw out the food that has been contaminated, and contact rat removal services to help you remedy the problem. Rats give off a distinct odour that you should be wary of. Their scent smells musky, and if you have a rat infestation you’ll be able to smell rodent urine in areas with little ventilation. If you do notice any unnatural smells, contact the professionals. There’s nothing worse than your home or workplace being compromised! Like the damaged food packaging, another visible sign of a rat infestation is gnaw marks. Rodents need to sharpen their teeth regularly, and so they gnaw on household areas such as furniture, walls and more seriously pipes, plumbing and electrical cables. It’s not uncommon for fires and water damage to happen to homes because of a rat’s gnawing. The best solution for a pest infestation is prevention. Keep your home or workplace clean, and don’t leave food or scraps around. Ensure that there are no open entries to your home from the outside, such as holes in the wall. However, rat infestations can still occur even with you thinking you’ve done everything you can to prevent them. If you do have a rat infestation, don’t stress! contact the professionals at Dawson’s Australia to get the job done right!